We like the notion of dating. When we go out on dates, we wear our best dress and smile to impress. Thinking that our better half is somewhere in the crowd makes dating more thrilling and enjoyable. We feel good when we find a person who is more attractive, intelligent and successful than ourselves. This might be the case for women but men consider intelligent women a turn-off. If men are asked, they will usually say that they find smart women attractive but this is the opposite when it comes to dates. Men actually fear high-achieving women. This is according to the latest study published in Personality and Social Psychology Bulletin conducted by University of Texas. 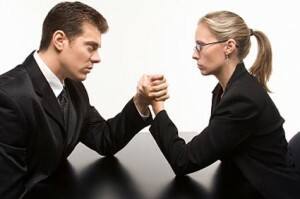 The researchers found out that men are intimated by women more astute than them. What does this tell us? Men actually fear intelligent women. The researchers say that the feelings of masculinity are diminished when a man realizes that his prospect romantic partner is more astute than him. The first experiment included one hundred five respondents. They were presented with women who scored better than them on given tests. The second version of the study included one hundred fifty one men who were asked to meet the women who fared better than them. The third version included men interacting with women regardless of their intelligence. In the fourth version, men rated the women. Men rate women less desirable and attractive if she scored better than him. The fifth version includes face-to-face interaction. The participants shared information like schools, birthday, relationship status, age and other basic information. The sixth version was the same like the fifth but the difference is that men only saw the woman for a few minutes and did not interact with them. The study clearly reflects that dating is a complicated affair – we do not know what we want even though we think we do. Even if men say they like smarter women, when they are face-to-face, they are not so into women who intimidate their intelligence. Researchers still need further experimentation to confirm this conclusion. We will have to wait and see further experimentation. Maybe this is common for many Singaporean men out there but the important thing is the feelings. If both people are mutually committed to the relationship no matter how intelligent the other one is, it will surely prevail.